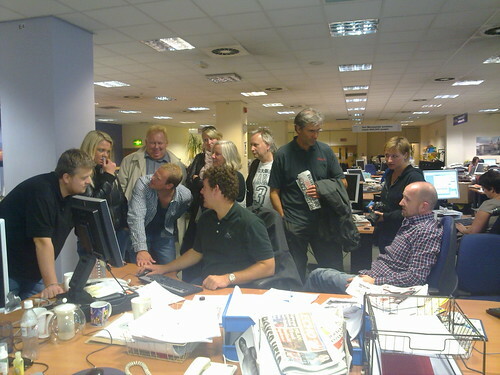 I had the pleasure of meeting a group of print and broadcast journalists from Norway who dropped by the Post&Echo offices on Friday, while they were on a union-led, team-building outing to Liverpool. Lars Johnsten, of Drammens Tidende, contacted me to suggest meeting up after a mutual acquaintance (whom I first met and admired on Twitter before making Real World contact at the News Rewired conference earlier this year), journalist and blogger Kristine Lowe, hooked us up. It was fascinating to talk about the issues and developments in the industry, and get their take on things – cutbacks, newspaper ownership, paywalls and what (if any) content you could conceivably charge for. Lars’ paper has just developed an iPad app and I will be very interested to see how that takes off. Likewise, they were interested to know how the newsroom operates having taken out a production tier, with reporters writing onto electronic pages and no sub editors. It brought home to me – yet again – how my work as a journalist, and my day-to-day job – has been enriched by social media. Without Twitter and blogging, we would never have had that point-of-contact and this random meeting – which really enlivened a Friday afternoon – would probably have never happened. It’s a small point, but it’s one I do well to remind my self of. And it’s a nice example to have up my sleeve if I’m asked (as still occasionally happens) what the returns are for the time invested in social media. Making real life friends is a pretty good return, I’d say.